Camrose Pride Community was started from a gathering of parents, school counsellors, social agencies, professionals and community members who wanted to explore the supports for those on the LGBTQ2S+ spectrum in Camrose and area. From those early beginnings in April 2015, Camrose Pride Community has grown and developed through the active involvement of a wide age range of committed LGBTQ2S+ members and allies. Camrose Pride Community is led by a core Leadership Team of Gus Belcourt and Wayne Wilson, co-chairs and until recently, Carol Breitkreutz, Secretary. Carol, who has recently moved away from Camrose, has been an integral part of the Camrose Pride Community, and we will forever be in her debt. The Camrose Pride Community has applied for status as a Non-Profit Society, and we are excited to see how this transition will help us grow as a community! If you are interested in being a part of the Leadership Team, please get in touch! The Camrose Pride Community is also advised and supported by The altView Foundation whose mission is to build diverse pro-queer and pro-trans communities in Alberta through advocacy, education, empowerment, collaboration and the arts. Numerous events, such as a Community BBQ and All Ages Dance Parties, and Pride Week activities in collaboration with Augustana Queers and Allies (AQUA) in the last couple of years, have been hosted successfully to reach out to the wider community. The last two Pride weeks also included a well-attended So You Think You Can Drag All Ages fun event that is loved and enjoyed by all. Camrose Pride Community has three regular monthly meetings: a Family and Friends Support group on the first Monday of the month, a Sharing and Planning meeting on the second Monday of the month, and an espressOUT drop in coffee conversation group on the last Monday of the month. 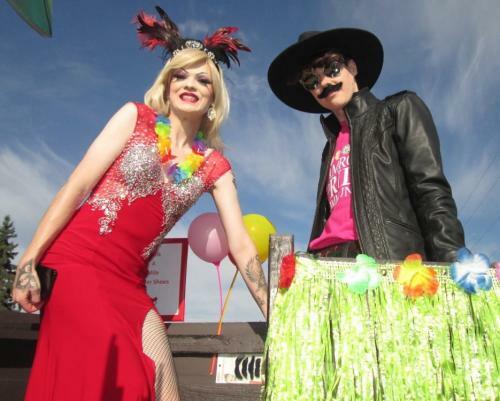 The Camrose Pride Community creates safe and inclusive spaces for LGBTQ2S+ people and allies in Camrose and area by hosting events, providing education and fostering collaborations. Everyone is welcome to join us in our efforts to address oppression and marginalization of gender and sexual minorities in Camrose. Together, we believe all of us have the right to exist and live as we are, without fear of prejudice and violence.